We received a somber, early morning call. It was not about flooding, or weather, or a close friend, but news that Letitia Baldrige had died. This is the kind of call we get. It is important news at Lucindaville when such an arbiter of etiquette has departed this earth. Letitia Baldrige is perhaps best known for her tenure as the White House social secretary to Jacqueline Kennedy. 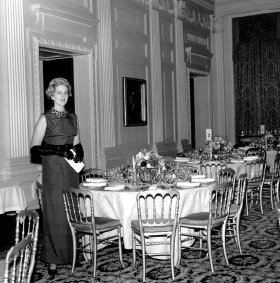 While much of the planning of the elaborate White House events were the result of Baldrige's meticulous attention to detail, she always made sure the First Lady received the credit. After a slight of a Pakistani ambassador she tried valiantly to apologize, finally waring him down with a bouquet of roses. It became a mantra. If you screw up -- send roses. 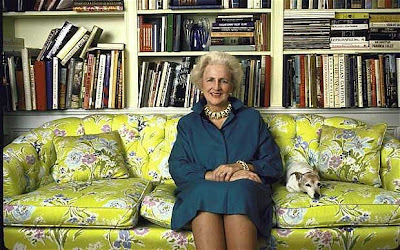 Today we are sending roses out to the memory of the incomparable Letitia Baldrige. Oh heavens, may she rest in peace. Every citizen must tour the Nations House--the White House I have had the good fortune to have toured it with the safety Patrol of my child's elementary school. I wonder if they were impressed with all the fresh flowers I was told there are four florists on staff. My husband and I often lament the very thing mentioned here: the passing of civility.